Every car comes from somewhere. This is the first part of four covering how the design of the fourth-generation Mazda MX-5 Miata came to be. Commonly, we think the lead singer is the band. He or she is the only reason the band ever became famous—or so we’re led to believe. Remember, though, there’s the drummer keeping beat, a bassist supporting the timing of the rhythm guitarist and perhaps a few uncredited backup singers making the singer’s voice sound extra powerful. The same applies when designing a car. While oftentimes one person receives credit as the design chief, it takes a long cast of characters to not only design a car but also drive its inspiration. Take, for example, the fourth-generation MX-5 Miata that went on sale in 2015. Their work—and the work of teams from Mazda Corporation in Hiroshima and Tokyo, Japan; Irvine, California-based Mazda Design Americas; and the Frankfurt, German-based Mazda Design Europe shaped Mazda’s smallest but perhaps most vital car. All of the design departments had to work under a very difficult fact: the MX-5 is timeless, somehow being both classic and thoroughly modern at the same time. They had to figure out how to make the car appeal to a new set of buyers without alienating those who made it the best-selling roadster of all time. 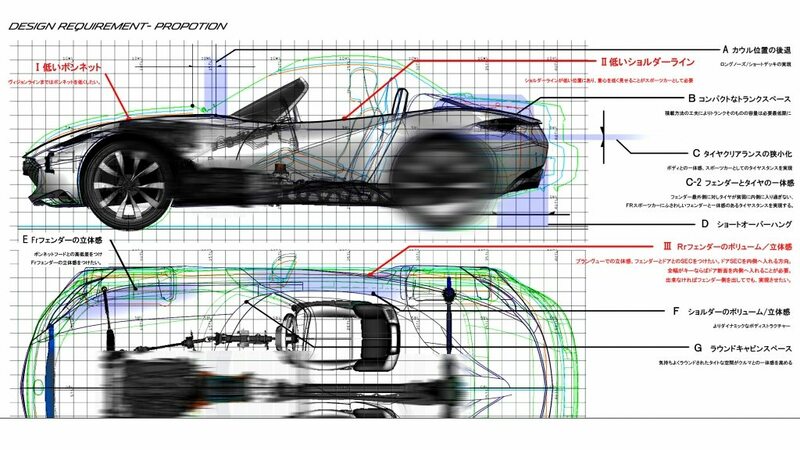 Upon setting targets, the program team set proportions of the MX-5. Rather than retaining the familiar, somewhat symmetrical shape, with the cabin in the middle of the car, the lines of KODO—Soul of Motion design called for a cab-rearward look, evolving the car’s proportions with some of the same appeal of exotic, European roadsters of yore. Designers and engineers moved the windshield back 70mm from where it had always been. With the MX-5’s “hard points”—where the structural elements of the car like the windshield would be—set, the teams were provided three objectives for Mazda’s next-gen sports car: Beautiful proportions, a roof opens and closes beautifully and details that tickle minds of enthusiasts. The teams had to create a car that complemented the KODO design language but also expanded upon it in a way that was unique to the MX-5. In June 2011, all of the studios submitted 1/4-scale clay models showcasing what they felt the next generation MX-5 should look like for evaluation. Each brought unique details that deserved consideration.